The seminar is organised by Peter Heinzner (Bochum), George Marinescu (Cologne), Jean Ruppenthal (Wuppertal) and myself; meetings take place twice per semester in one of the four participating universities. Information on planned and past meetings can be found here. My research group is actively participating in and partly funded by the SFB/TRR 45 (Bonn - Duisburg-Essen - Mainz), in particular in subprojects M08-9 "Birational geometry of hyperkähler manifolds" (PIs: D. Greb, D. Huybrechts, V. Lazic) and M08-10 "Moduli of vector bundles on higher-dimensional varieties" (PI: D. Greb). I am a participating external scientist in the SFB-Transregio 191 "Symplectic Structures in Geometry, Algebra and Dynamics" based at the universities of Bochum and Cologne. My main point of contact is project A3 "Geometric Quantization". 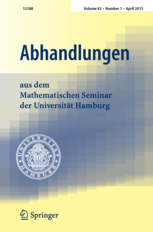 Since June 2016, I am a member of the editorial committee of Abhandlungen aus dem Mathematischen Seminar der Universität Hamburg. The journal's aims and scope can be found here. Please follow this link to obtain information concerning submission of papers. Springer's website for the journal can be found here. 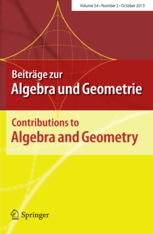 Since January 2017, I have been a member of the editorial committee of Beiträge zur Algebra und Geometrie / Contributions to Algebra and Geometry. Since November 2017, I am one of the managing editors, responsible for submissions in Algebraic Geometry. Please follow this link to reach the platform for online submission of papers. CIRM-workshop "French-German Meeting in Complex Algebraic Geometry"
Together with Andreas Höring (Nice) and Matei Toma (Nancy), in Spring 2018 I organised a workshop at CIRM, Luminy. More information can be found on the following website. Workshop "Lie Groups, Invariant Theory & Complex Geometry"
Together with Frank Kutzschebauch (Bern), Christian Miebach (Calais), and Jörg Winkelmann, I organised a workshop on "Lie Groups, Invariant Theory & Complex Geometry", which took place June 1st and 2nd 2017 in Essen. More information can be found on the following website. ICMS-workshop on "Positivity in Algebraic and Complex Geometry"
Together with Sándor Kovács (Seattle), Alex Küronya (Frankfurt), and Julius Ross (Cambridge), in Spring 2017 I organised a workshop on "Positivity in Algebraic and Complex Geometry" at ICMS Edinburgh. Together with Jochen Heinloth, I organised a School on Higgs Bundles and Fundamental Groups of Algebraic Varieties that took place from September 27th until September 30th, 2016 in Essen. SFB/TR 12 "Symmetries and Universality in Mesoscopic Systems"
I was an Associated Member of the DFG-Sonderforschungsbereich Transregio 12 "Symmetries and Universality in Mesoscopic Systems". I gave a series of lectures at the Winter School on Birational Methods in Hyperkähler Geometry, which took place December 1-5, 2014 at the Mathematical Institute of Bonn University. For more information, click here. As part of the group "Birational and hyperkähler geometry" (formed by Anne-Sophie Kaloghiros, Vlad Lazic, Chenyang Xu, and myself) I participated in the Junior Trimester Program "Algebraic Geometry" at Hausdorff Centre Bonn in Spring 2014 (January - April). As part of our activities, we organised a workshop on higher-dimensional birational geometry (see below), as well as several lecture series on topics such as characteristic p methods in the MMP. More information can be found on the program's website. As part of the 2014 Junior Trimester Program "Algebraic Geometry", Rob Lazarsfeld gave several lectures on "The equations defining projective varieties". More details can be found here. As part of the 2014 Junior Trimester Program "Algebraic Geometry" together with Anne-Sophie Kaloghiros, Vlad Lazic and Chenyang Xu I organised a workshop on Birational Geometry and Foliations. More details can be found here. DFG-Forschergruppe 790 "Classification of algebraic surfaces and compact complex manifolds"
I used to be a member of the DFG-Forschergruppe 790 "Classification of algebraic surfaces and compact complex manifolds". I participated in the projects "Differential forms on singular spaces and classification theory" and "Stability of vector bundles and rational quotients". DFG-Graduiertenkolleg 1821 "Cohomological Methods in Geometry"
I was one of the principal participating scientists and project leader in the Research Training Group GRK 1821 "Cohomological Methods in Geometry". I supervised the PhD project of Clemens Jörder and co-supervised the project of Tian-Shun Feng. In Freiburg I held a fellowship in the "Eliteprogramm für Postdoktorandinnen und Postdoktoranden" of the Baden-Württemberg Stiftung. My project "Symmetries in Complex Algebraic Geometry: Quotients and Moduli Spaces" was supported from 01/2011 until 07/2013. From June 2009 until October 2012 I was one of the organisers of the "Joint Seminar in Algebraic and Complex Geometry" (Freiburg - Nancy - Strasbourg). Summer School on "Birational Automorphisms of Varieties of General Type"
Organisers: Daniel Greb, Stefan Kebekus, and Alex Küronya. The school discussed the recent results of Hacon, McKernan, and Xu on the finiteness of birational automorphisms of varieties of general type. In Freiburg I participated in the interdisciplinary research focus Quantum Efficiency of the Institute of Physics. The main link between my research and this project is the use of (geometric) invariant theory in the study of entanglement.